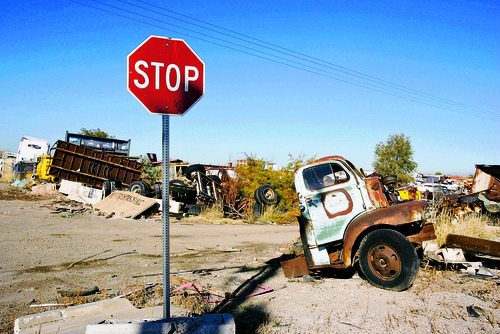 Assessment • Sliver of land near Magna has state's highest tax bill. Francisco Kjolseth | The Salt Lake Tribune The highest rate of property tax in the state turns out to be in an area in West Salt Lake City at about 7500 West and 2100 South. 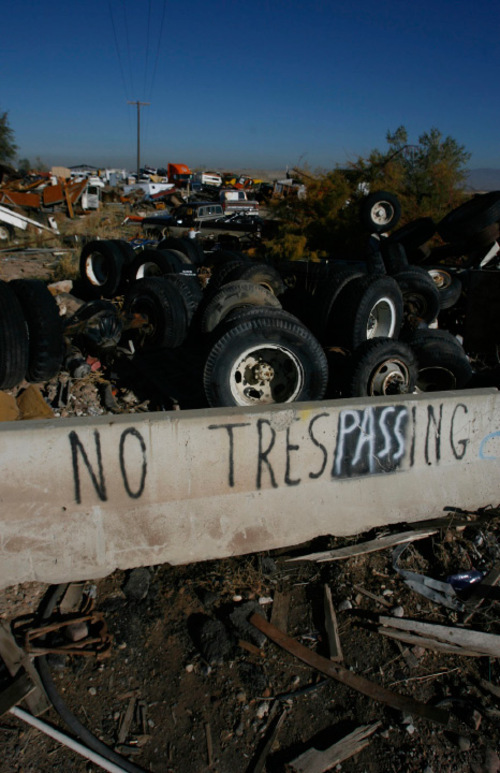 The area of high tax is bounded by 2100 South (on the south) 7500 West (on the west) and 7200 West (on the east) which is currently occupied by a junk yard and a large field with grazing horses. FRANCISCO KJOLSETH | The Salt Lake Tribune Utah's highest property tax turns out to be in an area in West Salt Lake City at about 7500 West and 2100 South. The ambiance is not what you'd expect of an area that has the priciest tax bills in the state. FRANCISCO KJOLSETH | The Salt Lake Tribune Utah's highest property tax turns out to be in an area in West Salt Lake City at about 7500 West and 2100 South. The ambiance is not what you'd expect for property judged to be worth so much, based on its tax bill. FRANCISCO KJOLSETH | The Salt Lake Tribune The highest property tax in the state turns out to be in an area in West Salt Lake City at about 7500 West and 2100 South. Ambiance in the area is probably not what you'd expect for what the tax bill says is such valuable property. Property taxes high? 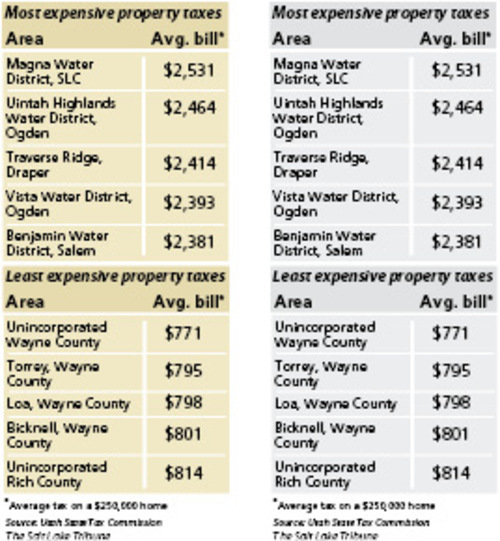 Move to rural Utah Residents living in the Magna Water District pay, on average, the highest property taxes in the state -- $2,531 in 2010. Too high? Move to unincorporated Wayne County where the average tax bill this year was just $771. 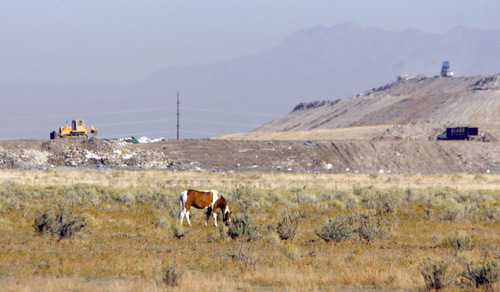 Old sofas, tires and other trash litter acres as a few horses graze on sparse grass among sage. A key road is not paved, is deeply rutted and impassable at points with muddy holes. 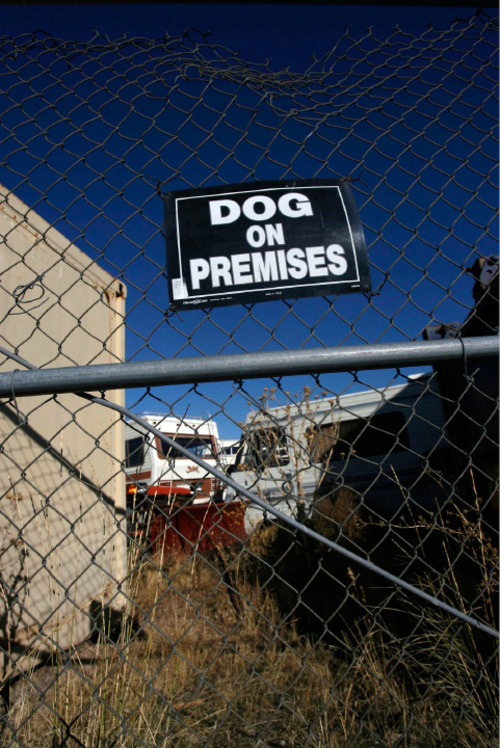 And in a far corner is a junkyard with spray-painted signs warning "dog on premises" and "stay out." Welcome to Tax Area 13G in Salt Lake County, the priciest real estate in Utah  at least judging by the tax bill. This desolate sliver of Salt Lake City at about 7500 West and 2100 South near Magna Township has the highest property taxes in the state. If there were a home here valued at the county average of about $250,000, it would pay annual taxes of $2,531. That is more than triple the calculated bill for the same value home in the lowest-taxed area in Utah, in unincorporated Wayne County. Taxes there this year would be a mere $771. The view's a lot better, too. "It's beautiful here. It's not a just a good place to live, it's a great place to live," says Wayne County Commissioner DeRae Fillmore. Her unincorporated county farmland is not too far from Capitol Reef National Park, and she says low taxes have enhanced  not harmed  the area's quality of life. A Salt Lake Tribune analysis of state Tax Commission data reveals how high or low property taxes are in different parts of the state  with Tax Area 13G and unincorporated Wayne County at the extreme ends of the spectrum. The comparison allows home­owners to weigh their tax bill against the statewide median of $1,731 for a $250,000 home after property tax notices went out last week. Taxes are due by Nov. 30. Among the state's 15 largest cities, those with the highest overall property taxes generally are Ogden, Salt Lake City and West Valley City, in that order. The lowest taxes, generally, are in Provo, Murray and Orem. But taxes can vary widely, even within individual cities, because the crisscrossing boundaries of more than 500 local governments in Utah create 1,357 different "tax areas" with different property tax rates. Each one has a different mix of taxing authorities, including counties, cities, school districts and special districts for water, sewer, fire protection, libraries, cemeteries, mosquito abatement, recreation and other services. Tax rates are highest in Tax Area 13G because a relatively high number of different local taxing jurisdictions overlap here, and many of them have comparatively high rates for the types of services offered. A property owner in Tax Area 13G pays eight governments. The cost on a $250,000 home would break down this way: Salt Lake City School District ($876), Salt Lake City ($746), Magna Water District ($374), Salt Lake County ($357), Central Utah Water Conservancy District ($58), Salt Lake Metropolitan Water District ($57), Jordan Valley Water Conservancy District ($56) and Magna Mosquito Abatement District ($7). Meanwhile, unincorporated Wayne County has low taxes in part because it pays to just three local governments, and they also tend to have low rates for their types of services. The taxes there on a $250,000 home would go to: Wayne County School District ($508), Wayne County ($259) and Wayne County Water Conservancy District ($4). "I'm not surprised we have the lowest taxes in the state," Fillmore said. "We're pretty conservative here and try hard to hold down taxes." She said she's happy with services. One major difference compared to many areas is that her property is not connected to a government sewer system, using a septic tank instead. Well above the median tax of $1,731 statewide is most of Ogden, which has six of the top 10 tax rates, ranging from $2,349 to $2,469 on a $250,000 home. Four other cities had one tax area each among the top 10 most expensive: Salt Lake City (the remote Tax Area 13G near Magna); Draper (in its ritzy Traverse Ridge area, $2,414 on a $250,000 home), Salem (portions in the Benjamin Cemetery District, $2,381) and a sliver of West Valley City in the Magna Water District ($2,318). Tax areas with the 10 lowest rates in the state are mostly in Wayne County (five of the bottom 10, ranging from $771 to $817 in tax on a $250,000 home), Rich County areas near Bear Lake (four of the bottom 10, from $814 to $854 in taxes) and a rural Summit County area near Park City ($849). Even though taxes can vary greatly within individual cities or communities, large sections of them often tend to have the same tax rates. The Tribune compared taxes among such typical areas of the 15 most populous cities in the state. The most expensive typical areas in those largest cities included: Ogden ($2,352 on a $250,000 home), Salt Lake City ($2,112) and West Valley City ($2,038). The lowest among the 15 largest cities included: Provo ($1,487 on a $250,000 home), Murray ($1,590) and Orem ($1,610). Others among the 15 largest cities included: Draper ($1,978 on a $250,000 home), Sandy ($1,917), Layton ($1,861), South Jordan ($1,786), Bountiful ($1,765), West Jordan ($1,742), St. George ($1,722), Logan ($1,713) and Taylorsville ($1,711).